Thai food is definitely a favourite of mine and this week’s Taste Off couldn’t have come at a better time. My parents are holidaying in Thailand at the moment and have been sending me photo upon photo of all the delicious Thai food they are eating every day. By the end of the week, I was absolutely hanging out for a Thai meal or two. This week’s call out for Canberra’s best Thai revealed RiotACT readers enjoy a good Thai meal almost as much as I do. We had votes for more than 20 restaurants across Canberra and, while I can’t name them all here, some of the more popular include Thai Chiang Rai in Kingston, Thip’s Thai in Belconnen, Joe’s Thai Food in Wanniassa, Soi-8 Thai in Griffith, Madam Woo in Kingston, the many Chong Co restaurants dotted around town and Lime Leaves Thai located across the border in Queanbeyan. The Taste Off, however, is always between the two most popular places and this week Morks on the Kingston Foreshore and Thai Herb in Harrison came out on top. Being a born and bred southsider, Thai Herb in Harrison isn’t somewhere I would normally find myself eating dinner, but this week I made the trek out to the northside with some friends and was not disappointed. Thai Herb is one of those hidden suburban gems that makes the Canberra dining scene so unique. We shared a delicious meal of red duck curry, pad thai and peanut sauce vegetables with a serving of both coconut and saffron rice. The lychees in the curry made it a favourite, while the pad thai was light and fresh and the peanut sauce was on point. It isn’t hard to see why the restaurant was full and the kitchen was smashing out takeaway orders like there was no tomorrow. Morks on the Kingston Foreshore is a completely different Thai food experience to any other place in Canberra. Some describe it as contemporary Thai, others say Thai fusion, but no matter what you call it, you can be certain you won’t find the traditional dishes you do at other Thai restaurants around town. What you will find at Morks however, is a delicious and creative take on traditional Thai flavours. We tried the BBQ pork buns, the pumpkin wonton panang curry, duck red curry with crispy rice cake and the fried tofu in sate sauce. 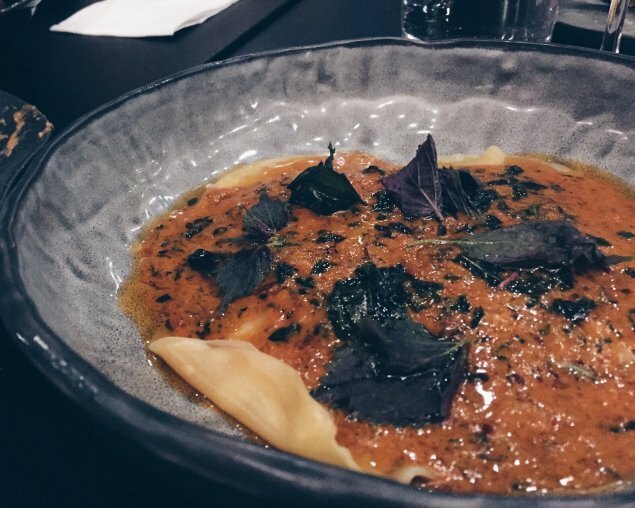 The pumpkin wonton dish was my pick of the night – it was spicy, saucy and the pumpkin made it just that little bit sweet. This week’s Taste Off was another difficult decision. Thai Herb and Morks are so different that comparing them is almost impossible and I couldn’t fault either of them – that’s why this week, I’m calling a tie. 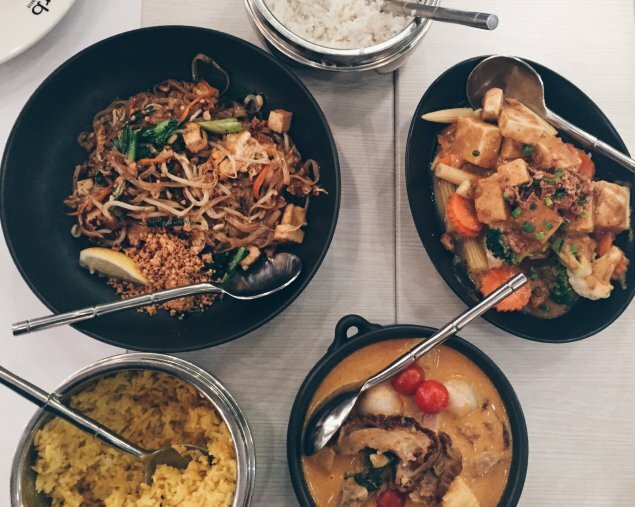 If you are looking for a delicious, down-to-earth traditional Thai feed, then Thai Herb is your winner. If you want something a little more adventurous, a little more creative and a little more upmarket, then Morks has got your back. Thai Herb v Thips. Morks v Thirst. More apples to apples, perhaps? It’s not though. It is between a Thai restaurant and a Thai fusion restaurant run by Thai’s (who once owned the Thai restaurant in Yarralumla). How anyone could compare them is beyond me, and also beyond the poster going by their conclusion! I think what it comes down to is there are lots of great Thai restaurants in Canberra. It just depends what style of Thai you feel like. My personal favourite is Madam Woo. So delighted to read that you’ve marked these two as a tie, Bec. Both are fabulous in their own right, while being very different too.